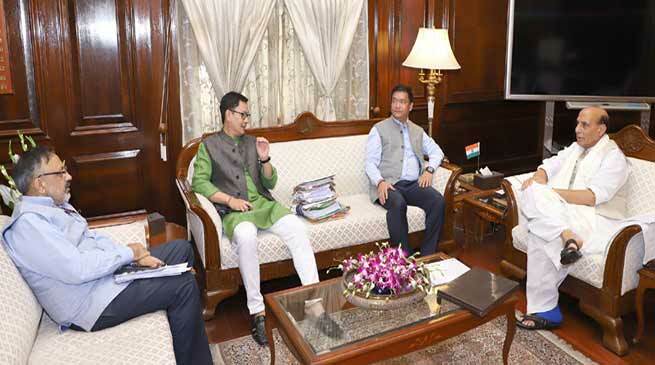 Chief Minister Pema Khandu today attended a high level meeting with the Union Home Minister on the vexed issue of the Chakma Hajong in Delhi today. Chief Minister during the meeting put forth the concerns of Arunachal Pradesh, especially in relation to protecting the indigenous population of the state. He said while referring to the BEFR Act 1873, “The ethnic composition of the state is an important aspect which needs to be safeguarded”. Referring to the all party meeting held earlier in the State, he requested the Home Ministry to revive the Joint High Power Committee to be headed by a MOS. Such a forum will be able to meet and resolve the vexed issue more meaningfully. Proposal for constitution of a State High Power Committee is also under process. Pema cogently conveyed the concerns raised in the all party meeting. It may be noted that the matter is subjudice and the State Govt has filed a SLP in the Hon’ble Supreme Court in this matter.